Today’s post is by Kathleen Cutler, an alum of my Ad Consultant Incubator training program. I wish I could say I played some role in the outstanding campaign she outlines in this post, but this was all Kathleen! Pay close attention if you’re trying to sell physical products with Facebook ads. 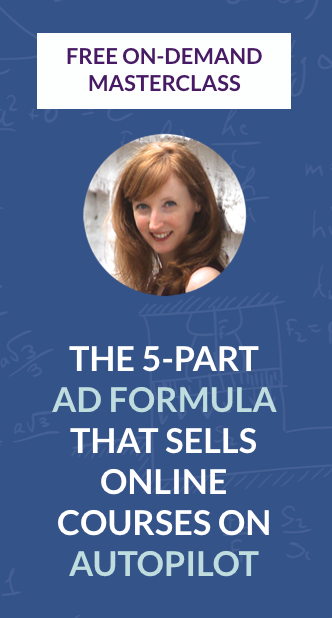 Creating super targeted ads to a niche audience is an amazing way to convert eCommerce traffic into sales. However, it is not as easy as some marketers might have you think. There are some critical steps that you can’t miss, otherwise you risk leaving money on the table. To demonstrate, I’m going to walk you through a case study of my own. I’ll show you how a $7.50 per day spend in a super niche market generated a 40% increase in sales by utilizing the five key components listed above. Market Square Jewelers is a multi-million dollar antique and estate jewelry company. When they first launched their website, they had very little brand awareness and were in a fiercely competitive market. 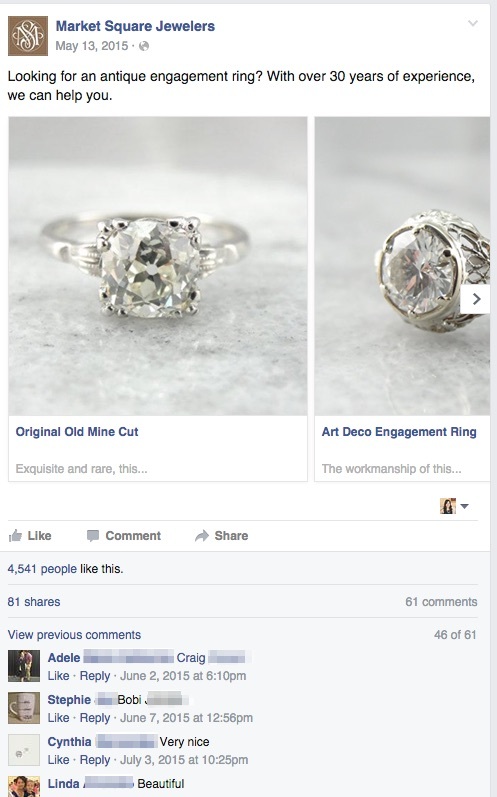 To help raise awareness, we launched a Facebook ad campaign to drive people to their website based on their most popular and iconic items– their antique and estate engagement rings. In response to this unique target, we could have created a complex campaign filled with interests matched with audiences, but instead we decided to create ads targeted at one very specific demonstrated interest: Brilliant Earth– a leading seller of diamond rings, with a growing sector of antique and estate diamond rings. In other words, our biggest competitor. The most unique similarity we shared was a “quirky” behavior and attitude towards buying a diamond ring. According to their website, Brilliant Earth was co-founded by Beth Gerstein and Eric Grossberg, who met at Stanford University. When Beth was about to be engaged, she experienced firsthand the challenge of finding a conflict-free engagement ring that represented her values. “Represented her values” is the key phrase here. Customers buying antique engagement rings are often doing so because they are highly value driven individuals. They don’t need the biggest diamond, so targeting a company that sells perfect, large diamonds like Forever Mark wouldn’t be a good fit. People who are searching for a mass produced diamond (like Kay’s or Jared’s) would also be out. We knew our target would settle for no less than having a unique engagement ring that fully represented their values. Engaged fans, a large audience and a niche match all the way down to individual customer values; it’s this level of detail that makes this type of targeting successful. Pro Tip: Use Facebook Audience Insights to get to know your competitions Facebook fans and understand exactly what they value and to see if it is a good match. Get started with this Audience Insights tutorial. When someone can’t touch the piece, they are forced to rely solely on the detail of the photos. This is especially true when the pieces are extremely expensive. There’s no place where this rings truer than in Facebook ads when people are scrolling through looking for engaging stories, photos and memes from their friends, not looking for advertisements from retailers. There are two options when you want to get a potential client to stop scrolling: You can either create a native ad that mimics the look of an engagement ring post from a friend or you can use beautiful, eye-catchingly detailed shots. By including “With over 30 years of experience,” we’ve addressed the first and second objections: “Will I receive the purchase?” and “Can I count on this business being in business if I run into a problem?”. With so many fly-by-night businesses online, it is comforting to the customer to know that they been operating successfully for 30 years, showing they have a proven track record. Closing with “we can help you,” also addresses a common objection in online sales: “Will I get the personalized attention shopping online that I would get in a physical store?” By directly dealing with this objection, we reassure the purchaser that they are in good hands. Write down 10 common objection you can expect from your customers. For example, if you’re selling a heavy product, you can talk about free shipping. If you’re selling a product that is often given as a gift, you can talk about your easy returns. We moved the ad spend up to $15/day, but then pulled it back down to $7.50/day, where it has been since. I’ve kept a close eye to make sure the CPC didn’t increase, but so far, it has held steady. This type of ad also has organic reach. Most comments were people sharing our ad with other people on Facebook. If we only let the ad run for a month, we wouldn’t have had the same amount of impact. 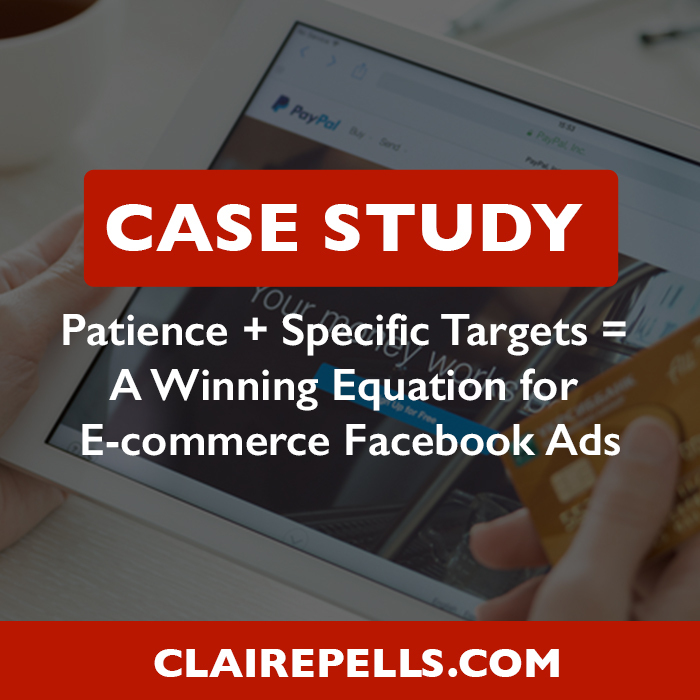 It’s for this reason that I always encourage my clients who want to run e-commerce Facebook ads to commit to being in it for the long haul and plan accordingly to be spending consistently over many months. Pro Tip: Choose a big audience and keep a close eye on your CPC (or cost per conversion) to make sure that it doesn’t increase over time. It is common for someone to disengage before making the final purchase during the sales process. This could be due to anything from not being able to find their wallet to not feeling ready to commit to the item. 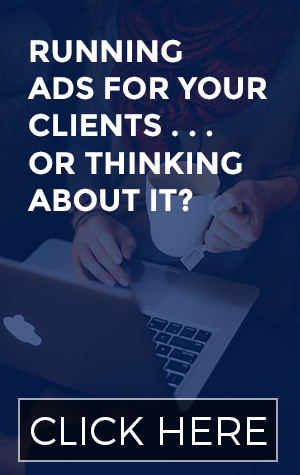 Create a simple ad that reminds them about what you offer. At this point, they are already warm traffic, so you don’t need to explain who you are as much as remind them you are ready to work with them. You could even use a customer review here to overcome an objection and show social proof that other people have purchased from you. Pro Tip: Set up your retargeting, so that you can target people who make it to your shopping cart, but don’t make it all the way to the purchase page. You can give them a special coupon to re-engage them and win them back as customers. Kathleen Cutler has spent the past nine years supporting various clients, from a multi-million dollar antique and estate jewelry company to coaches and yoga teachers creating ads to fill courses and make sales. 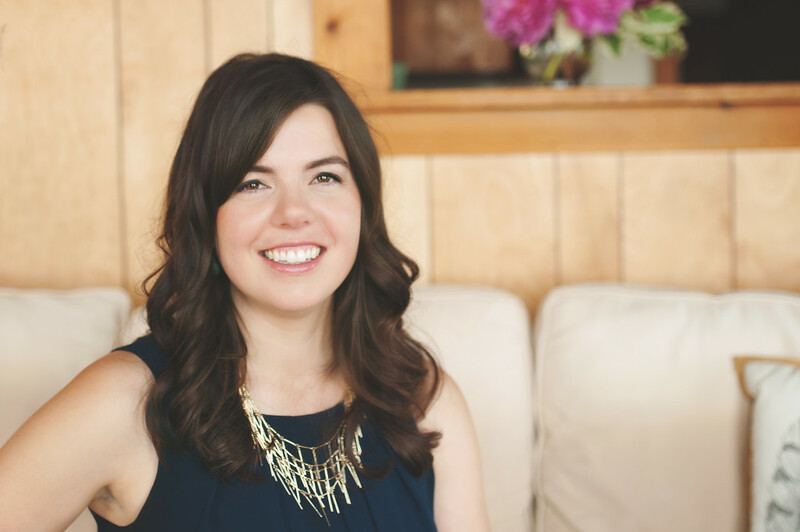 Combining her natural skill set with serious know-how, she’s built a successful business helping an international community of entrepreneurs reach their goals and serve their dream clients, one step at a time. When she is not working magic on your business, you can find her drinking too many double espressos or exploring the mountains with her husband. Be sure to join her for all things online business at kathleencutler.com.